congrats elham & ayafor :) | doberman pizza. 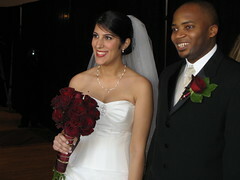 whole-hearted congratulations to Ayafor and Elham on their wedding this past Sunday. it was truly beautiful to see both of you at your best and surrounded by caring friends and family on such a very special and auspicious day. may your marriage be blessed with divine confirmations and be infused with the spirit of love, fellowship and unity for all eternity! See Kamran’s pics of the wedding on flickr.